"Few books have been as universally cherished by children and adults alike as The Little Prince. A beautiful gift edition of this touching and wise classic children's book, with the original translation by Katherine Woods and full-colour illustrations. A pilot stranded in the desert awakes one morning to see the most extraordinary little fellow standing before him. ""Please,"" asks the stranger, ""draw me a sheep."" And the pilot realises that when life's events are too difficult to understand, there is no choice but to succumb to their mysteries. He pulls out a pencil and paper . . . and thus begins this wise and enchanting fable that, in teaching the secret of what is really important in life, has changed the world forever for its readers. 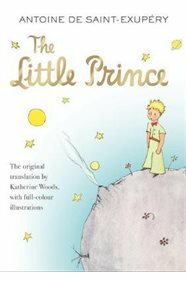 This stunning new edition of the classic children's book The Little Prince, includes the classic English translation by Katherine Woods and original colour illustrations which will capture the hearts of readers of all ages. Antoine de Saint-Exupery (1900-1944) was born in Lyons, France. He wrote The Little Prince in the United States during a two-year self-imposed exile from occupied France. A year after the book's publication in 1943, Saint-Exupery disappeared over the Mediterranean while flying a reconnaissance mission for his French air squadron. Best known throughout the world as the author and illustrator of The Little Prince, Saint-Exupery wrote several other books that have also become classics of world literature. Katherine Woods (1886-1968) produced the original English translation of The Little Prince in 1943. It was later followed by several other English translations, but her classic translation is treasured by fans and is often considered to be the definitive English translation. Her poetic translation perfectly captures the enchantment and charm of Saint-Exupery's storytelling."